The second day at Go Further with Ford started with a big breakfast and a warm welcome from two phenomenal women: Sheryl Connelly, Manager of Global Trends and Futuring, and Marisa Bradley, Consumer Media Communications Manager. We all tweeted about their fabulous shoes, naturally. The day's agenda was packed: trend sessions revolving around four topic areas- Streamline and Simplify, Accessible Design, Eco-Psychology and Urbanization. 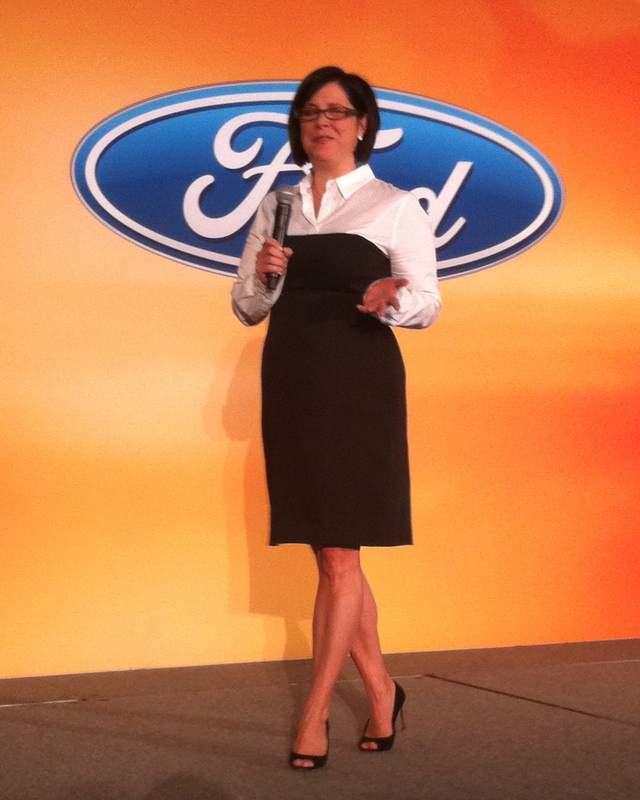 Each session included panel discussions with pertinent guest speakers and Ford experts, as well as breakout sessions with hands-on demos. The first stop on my list was Streamline and Simplify, where we learned more about the constancy of technology and how companies work together to improve the "conversation" you have with your vehicle. This conversation is often literal, with many apps using voice recognition and the cloud to keep your eyes on the road and your hands on the wheel but it can extend to biometric data being collected while you drive to enhance safety. (l-r): John Hendricks, Director of User Experiences for the Windows Embedded Division at Microsoft, Gary Clayton, Chief Creative Officer at Nuance, and Parrish Hanna, Ford's Global Director of Human Machine Interface. 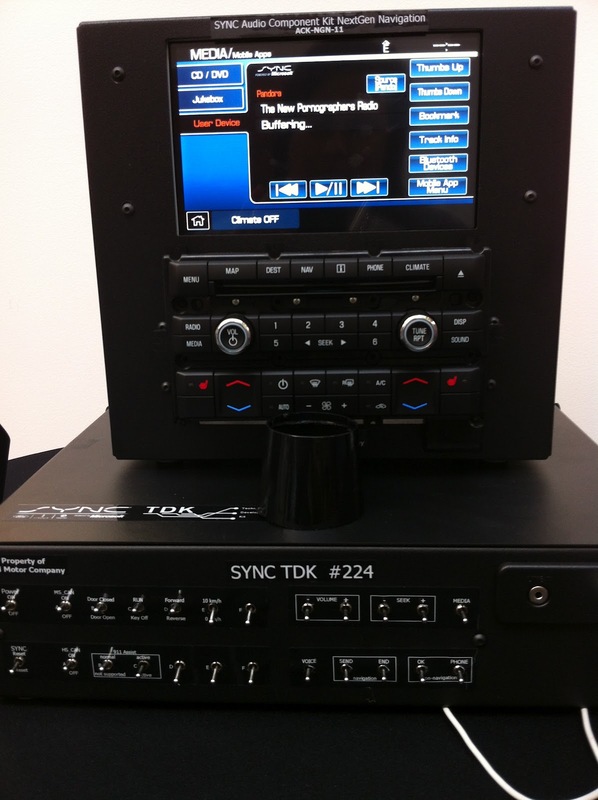 This black monolith is called a Technical Discovery Kit (TDK) and it is like a car in a box that developers can use to test functionality without bringing a huge car into the lab. There were several of them set up to give us an idea of how they work. 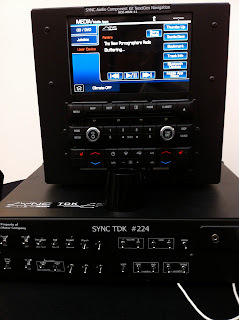 We saw how SYNC can use Google translators to allow you to have an almost real-time interaction in a foreign language and how I could pull up the New Pornographers on Pandora just by asking. So cool! The second session was Age of Accessible Design. I enjoyed hearing the panelists talk about the need to bring good design to the masses at an affordable price. Predictably, they all had snazzy shoes. (l-r): Ari Goldberg, CEO of StyleCaster, Gretchen Gscheidle, Director of the Insight and Exploration Group at Herman Miller, design wunderkind Christian Siriano, artist/architect Adam Kalkin and J Mays, Ford Group President of Design and Chief Creative Officer. My third session was Eco-Psychology, which I was really excited about. The public perception of environmentalism and how you can shift towards a greener thought process is something I truly believe in. 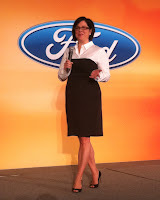 The speakers had a lot to say about the importance of companies of Ford's magnitude taking an environmentalist stance because it changes mass opinion, especially over time. Baby steps to green is a powerful motivator. (l-r): Cher Fischer, Peter Glatzer and Adrian Grenier of SHFT.com, John Viera, Ford's Global Director of Sustainability and Vehicle Environmental Matters, Liz Heller, Strategic Partnerships and Initiatives at TOMS, and Tim Sexton of E2. The breakouts for this session were really interesting. We got to see samples of naturally-derived plastics in development. We also got to visit the wind tunnel for a demonstration of aerodynamics and how it affects fuel efficiency. Steve Parks, Senior Aerodynamics Engineer with Vehicle Energy Management Engineering for Ford and Lincoln, demonstrates aerodynamics with smoke in the wind tunnel. 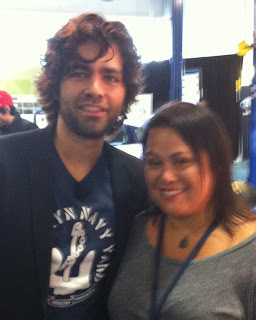 I also got this blurry photo of me with Adrian Grenier, who has really remarkable hair. He's also pretty passionate about the environment and filmmaking, which only serves to make him cuter. The final session for the day was Urbanization. I'll admit that I didn't think it would be very pertinent to me since Wichita is hardly a bustling metropolis. Carol Coletta is a dynamic speaker, though, and had plenty to say about why communities need to court creative innovators. Amen! She was funny and smart and had a fantastic dress and shoes, too. I was also really impressed to discover that Ford has a Manager of Social Sustainability, David Berdish (shown between Ford's Kristin Schondorf and Carol Coletta below), who is charged with ensuring their brand promise is the same for employees worldwide. Berdish was lead designer of the Ford Human Rights Code of Working Conditions, which was adopted in 2003 and continues to evolve under his supervision. These guidelines articulate Ford’s commitment to social sustainability and human rights throughout its global operations and $90 billion supply chain. Color me impressed. 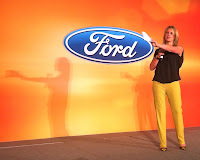 See more about Go Further with Ford: Day One, Day Two (TechShop Detroit) and Day Three. In accordance to the FTC Guidelines and the WOMMA Code of Ethics, I am disclosing that Ford paid for my travel and lodging.. No other compensation was provided. All opinions are, as usual, entirely my own.